As a property owner, you are of course invested in the care of your home or building. Starting with the façade, the interior decoration, down to the leaking faucet, you want to make sure everything is in working order. These are things you see and inspect every day. But how about the things that are hidden from your sight? When the problem is not only under the ground, but also embedded in concrete, it can be pretty tough to find the exact location yourself. Leaks may start small and go undetected for some time. Has your water bill suddenly gone up for no apparent reason? That can be indicative of water loss. If you suspect a leak in your home or property, don’t panic. Tracer Gas Leak Detection may just be the solution to your problem. This method of water leak detection is often used to identify large pipeline leaks. The method involves introducing pressurized gas through the pipes. The gas is then picked up by a sensor as it escapes through the leak, revealing its location. 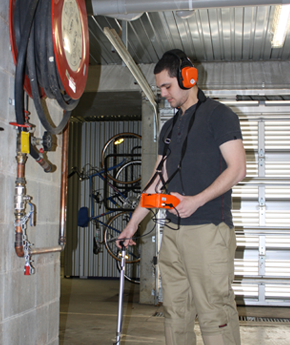 The tracer gas detection method may be used for both gas and water leak detection. There are two types of tracer gas employed in this type of operation: helium and hydrogen. High purity helium gas is injected into the pipeline. The tracer gas courses through the water, exits through the leak point, and quickly bubbles up to the surface. This gives away the water leak’s exit point. Using a special apparatus, hydrogen gas is introduced into the pipeline where water leakage is suspected. Being the lightest and smallest molecule, hydrogen is able to squeeze through the tiniest leaks. As the gas finds its way to the ground, its exact location is immediately picked up by a gas sensing device. The precision of the hydrogen gas detection method is unmatched. This approach is often resorted to when all other methods have failed. Water Leak Detectors which offers water leak detection services, is a Melbourne-based company. We have had years of experience offering tracer gas detection solutions in Melbourne and the entire state of Victoria. If you find suspicious leaks in your home or workplace, give us a call. We can help you detect water and gas leaks and move forward toward fixing it. Too many plumbing services are a hit and miss thing. Stop wasting your time and your money. What you need is a water leak detection service that is reliable, cost-effective and hassle-free. Call us today. We would be delighted to service you!